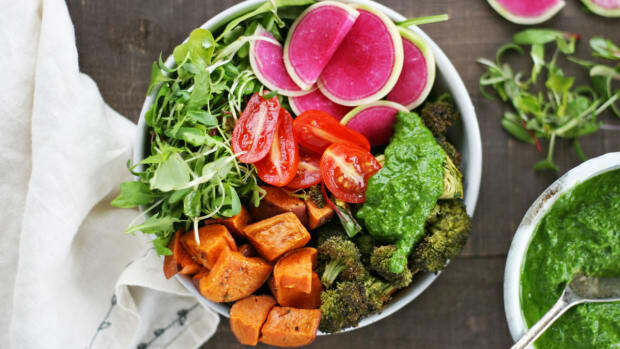 This simple and nourishing winter vegetable bowl is filled with hearty root vegetables, winter squash, spinach, and a zesty garlic-tahini sauce for the healthiest lunch or dinner, ever. 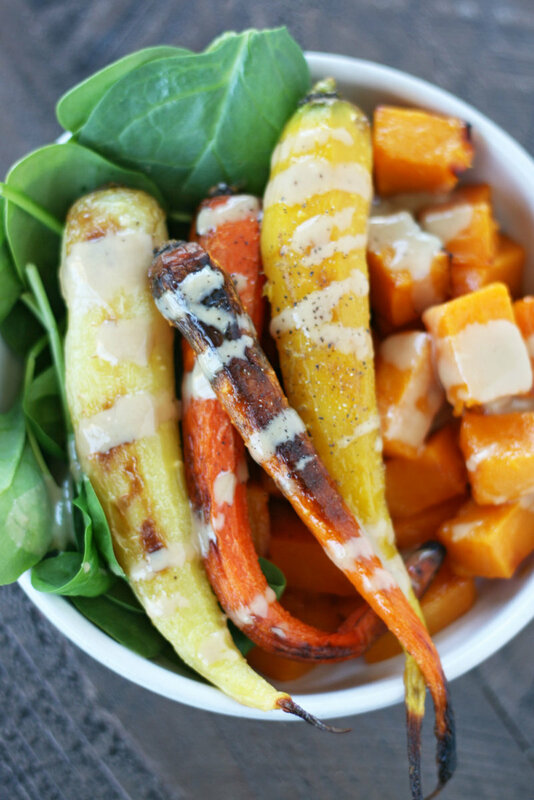 Made with wholesome butternut squash, sweet rainbow carrots, tender baby spinach, and homemade garlic-tahini dressing, this meal is comfort all the way. 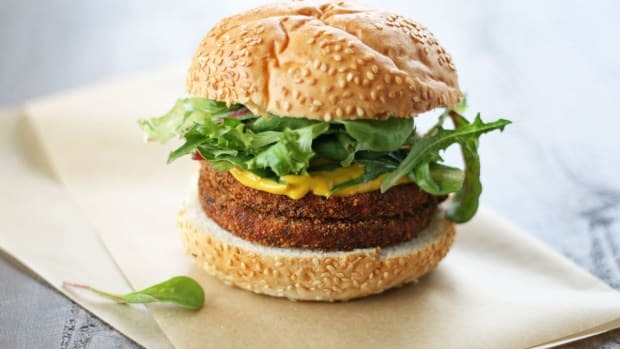 If you lack any of the recipe components, simply swap for what’s available or in season in your area. Butternut squash can be interchanged with delicata squash, acorn squash, sweet potato, or even parsnips. 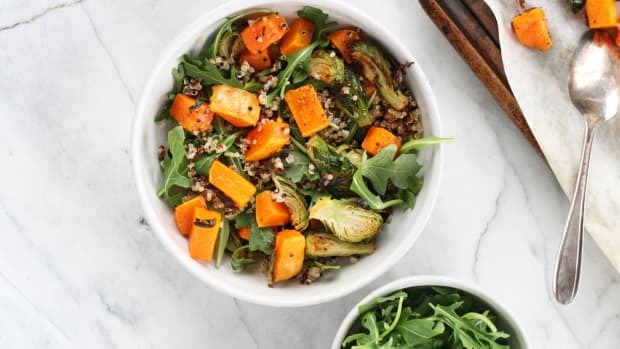 Switch out carrots with beets, Brussels sprouts, or cauliflower. 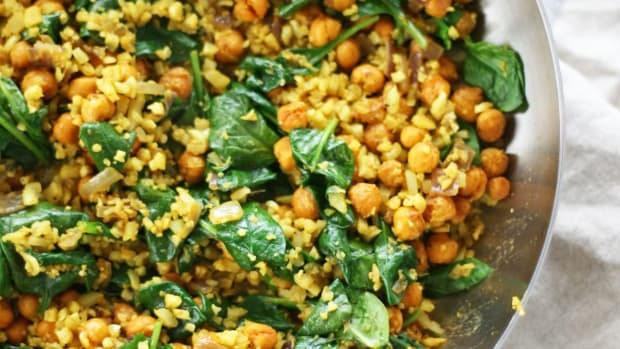 Finally, use any other leafy green that you may have on hand. Sautéed kale or chard work well, as does arugula or romaine. The only exception to this rule is the garlic-tahini dressing, because it’s absolutely mandatory – and addictive. 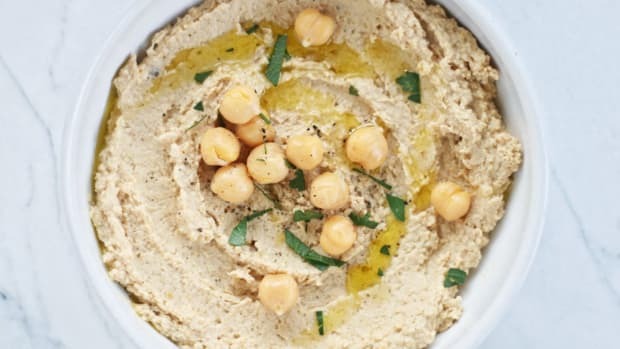 The noteworthy garlic-tahini sauce is made with four simple ingredients: tahini, olive oil, garlic, and lemon juice. Tahini, a ground-up blend of sesame seeds, is rich in healthy fats, vitamins, minerals, and fiber. It has a nutty taste and flavor unlike any other nut or seed butter out there. Look for jars of tahini at Whole Foods Market, Trader Joe’s, or online. Mixed with flavorful olive oil, antioxidant-loaded garlic, and brightening lemon juice, this sauce is simply otherworldly. 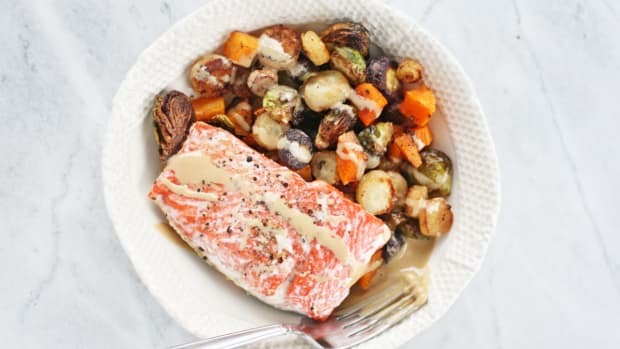 If you have extra garlic-tahini sauce (I suggest doubling the recipe), spoon it over sauteed kale, roasted chickpeas, pita bread, steamed broccoli, or cooked salmon and chicken. 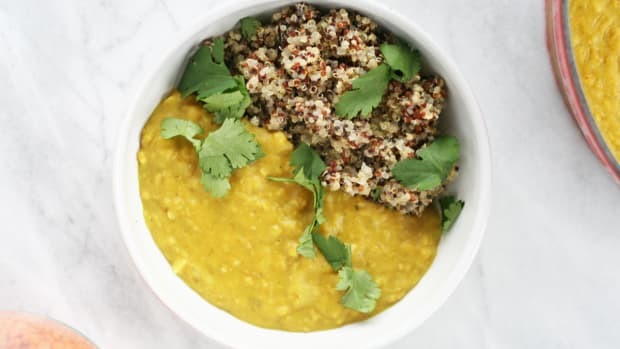 Enjoy this hearty vegan bowl all week long for a nutrient-packed and crave-worthy lunch or dinner. Add cubed butternut squash and whole, peeled carrots to baking tray. Drizzle with avocado oil and season with sea salt and pepper. While vegetables roast, prepare garlic-tahini sauce. 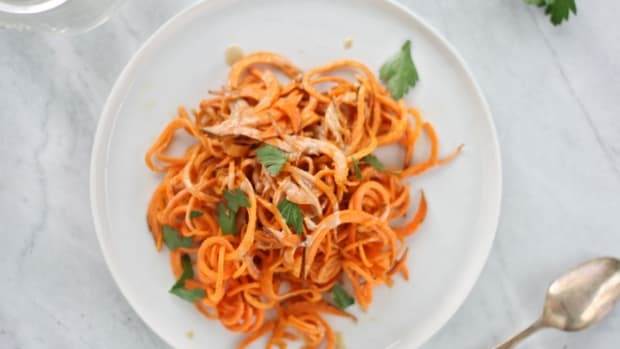 In a small bowl whisk together tahini, olive oil, and lemon juice. Stir in minced garlic, sea salt, and black pepper to combine. 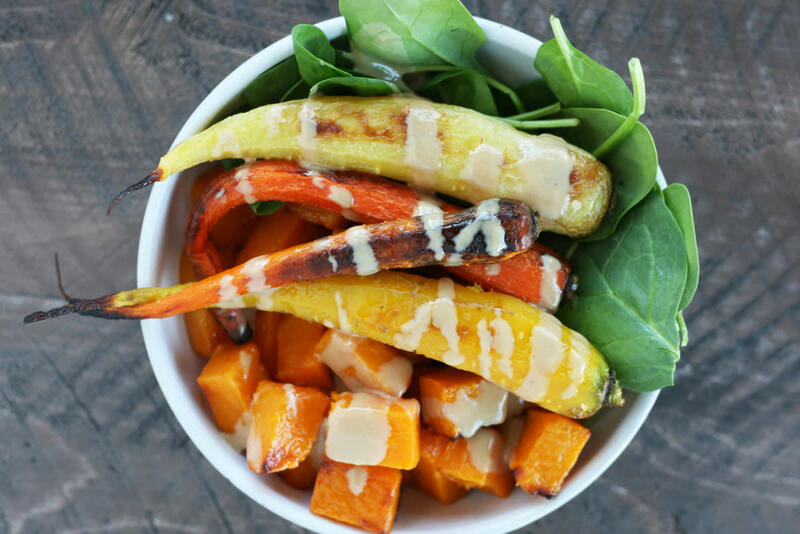 Divide spinach between two bowls and top with roasted vegetables and garlic-tahini sauce. Enjoy!